Both master and dog are recovering from Tuesday’s near-tragedy on subway tracks, and help is offered to support the dog’s retirement. NEW YORK — The guide dog that leaped onto subway tracks after his blind owner lost consciousness and fell off a station platform is assured a loving home after his retirement. 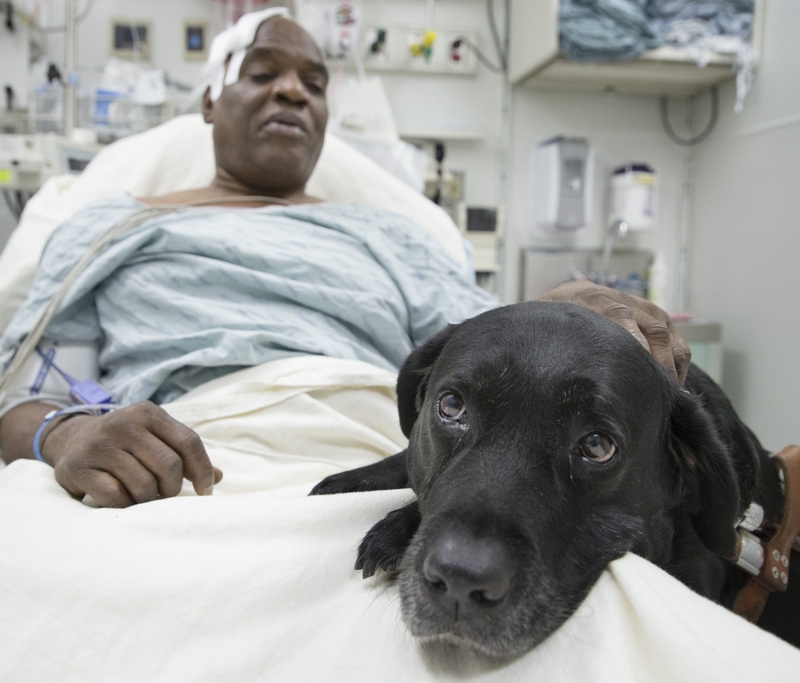 Cecil Williams, who has been recovering at a hospital with Orlando still by his side, had been slated to get another working dog in January or February to replace the 11-year-old black Lab. Now, he would ideally like to have two dogs – one working and one retired as a pet – if logistics, physical abilities and finances allow. Williams told The Associated Press on Tuesday that he couldn’t pay for a non-working dog, so he was planning to look for a good home for Orlando. Guiding Eyes, based in Yorktown Heights, N.Y., provides working dogs for free but cannot cover retired dogs’ expenses. After the AP published its interview and photographs of Williams with Orlando in his hospital room, St. Luke’s-Roosevelt Hospital Center has been fielding queries from well-wishers offering money and other assistance. Guiding Eyes has “graciously stepped forward to handle those inquiries,” said hospital spokesman Jim Mandler. Williams said that if he does decide he’s able to care for two dogs, he’d need help paying for the Lab’s care. The organization was setting up a fund and planned to post information on its website. If it turns out Williams doesn’t need the money, it will be used for other guide dogs, according to Brier. Also Wednesday, The Animal Medical Center, which already provides veterinary care to Orlando and other guide dogs, said in a statement it will treat Orlando for free after he retires. Williams, 61, and Orlando both escaped serious injury Tuesday when they were bumped by a train passing over them – a miraculous end to a harrowing ordeal that began when Williams felt faint on his way to the dentist. Witnesses said Orlando barked frantically and tried to stop Williams from tumbling off the platform. Matthew Martin told the New York Post that Orlando leaped onto the tracks as the train approached and licked Williams to entice him to move. Williams said Wednesday that he’s “feeling a little bit better” but wasn’t sure how long he’d be hospitalized.